This week USPTO issued 5525 patents and published 7429 applications. Each patent is important as it adds something new to the human knowledge base. PatentYogi team has selected the six awesome patents this week listed below. This patent discloses technology that enables real-time baseball gameplay between a first team associated with a first baseball field and second team associated with a second baseball field. The two baseball fields are located remotely from each other. Each field includes pitch sensors, fielding machines and pitching machines to receive, in real-time, the pitch information from the other field and release/catch balls in response. Holograms are used to mimic players on one field from the other field. Specifically, the method includes receiving, in real-time, manual pitch information sensorily obtained from a first field. The method further includes automatically pitching on a second field, in response to the receiving, based on the pitch information. The method additionally includes receiving, in real-time, manual hit information sensorily obtained from the second field based on the automatically pitching. The method also includes automatically fielding on the first field, responsive to the receiving, based on the hit information. People behave differently in the various online roles, from taking the role of a parent on Facebook to playing a role of a stamp collector on a stamp collecting forum. Some of the roles of the person and contexts of the online application may be incompatible with one another. For example, a civil servant may not want his posts regarding his celebrity-following activity to be known to his working colleagues. This invention for Google is a persona management system within a user’s single and unified online identity, including defining a plurality of personas for a single identity, the single identity comprising a plurality of personal attributes, associating each of the defined personas with at least one of the plurality of personal attributes, separating the plurality of personas associated with the single identity based on the at least one of the plurality of personal attributes, selecting one of the personas to use in an online interaction with an online application, and controlling access of the online application to the associated at least one of the personal attributes, based on whether the selected one of the plurality of personas corresponds to the online application. The user can switch between personas of the online identity while interacting with an online application. The persona switching can be conducted manually by the user, semi-automatically with a prompt, or automatically based on the context of the online application, should the user decide to set the persona switching settings to automatic. Aircraft structures may now be examined at various times, such as during manufacturing, to determine whether its structures have certain desired properties. Boeing patents an autonomous non-destructive evaluation system for aircraft structures. Boeing has been working diligently to automate its manufacturing plants. The latest patent discloses the autonomous evaluation system that may used to perform non-destructive evaluation a new aircraft or an aircraft in operation. 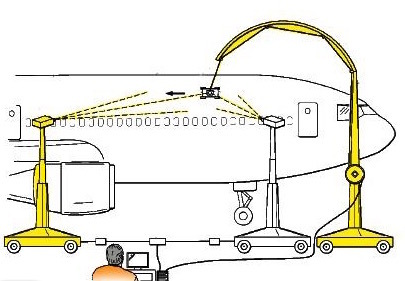 Inspection robots move around autonomously and use various sensors to evaluate the aircraft. This will help reduce human error while evaluation, will be cost-effective as well. Is it a bird? Is it a plane? It is an ornithopter? Mitsubishi filed patent for a flapping type drone that imitates birds. It has advantages over convention drones, from the viewpoint of quietness, low visibility and mimetic characteristics. For military applications, quietness is a crucial requirement. Recently, U.S. Military gave up on robots from Google because they were too loud. The flapping type drone has characteristics of both the fixed wing type and the rotary wing type. Ground-based reflector arrays redirect the solar radiation from the sun towards the solar relay aircraft. This will help deliver concentrated solar power, such as solar power at multiple-sun intensities, to an aircraft. The aircraft need not carry heavy batteries to store electricity generated from solar power, nor the aircraft needs to create additional surface to carry solar panels. The ground-based reflector arrays can focus on a power tower equipped with either photovoltaic or turbine based receivers to produce power for the grid when the arrays are not used to direct solar power to the solar powered aircraft. Hyundai filed a patent for a wireless charge system capable of wirelessly charging a smartphone. The wireless charge system is installed in door pockets of all doors of a car. Further, the wireless charge system is capable of informing a passenger (e.g., using an alarm) to not get out of a vehicle when a portable wireless communication device is left in the vehicle in the middle of a wireless charge of the portable wireless communication device.